Chemical migration in food. Part 1 Regulation and quality control of chemical migration into food: Regulation of food contact materials in USA; Regulation of food contact materials in the EU; Traceability and food contact materials. Part 2 Assessing the risks and improving the safety of food contact materials: Compliance testing of chemical migration from food contact materials; Exposure estimation – the missing element for assessing the safety of migrants from food; Toxicology and risk assessment of chemical migration from food contact materials; Mathematical modelling of chemical migration from food contact materials. Part 3 Chemical migration from particular food contact materials: Recycled plastics and chemical migration into food; Plastics and chemical migration into food; Metal packaging and chemical migration into food; Rubber and chemical migration into food; Food packaging inks and varnishes and chemical migration into food; Food packaging adhesives and chemical migration into food; Safety assessment of paper and board used in food packaging; Chemical migration from multi-layer packaging; Chemical migration from active and intelligent packaging materials; Chemical migration from secondary packaging into foods; Case study: Chemical migration from snack and take-away food packaging; Case study: PET as a food contact material. Food and beverages can be very aggressive chemical milieu and may interact strongly with materials that they touch. Whenever food is placed in contact with another substance, there is a risk that chemicals from the contact material may migrate into the food. These chemicals may be harmful if ingested in large quantities, or impart a taint or odour to the food, negatively affecting food quality. Food packaging is the most obvious example of a food contact material. As the demand for pre-packaged foods increases, so might the potential risk to consumers from the release of chemicals into the food product. Chemical migration and food contact materials reviews the latest controls and research in this field and how they can be used to ensure that food is safe to eat. Part one discusses the regulation and quality control of chemical migration into food. Part two reviews the latest developments in areas such as exposure estimation and analysis of food contact materials. The final part contains specific chapters on major food contact materials and packaging types, such as recycled plastics, metals, paper and board, multi-layer packaging and intelligent packaging. 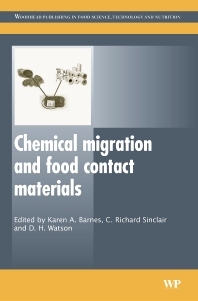 With its distinguished editors and international team of authors, Chemical migration and food contact materials is an essential reference for scientists and professionals in food packaging manufacture and food processing, as well as all those concerned with assessing the safety of food. Karen Barnes works for the highly regarded UK Food Standards Agency. The Agency is internationally renowned for its research on chemical migration.